In the realm of the gallery exhibition, the two-person show is a tantalizing proposition. It suggests an opportunity to compare and contrast, not simply within a single artist’s output, but in the reflected light of another’s. Done well, this method amplifies our understanding of each artist by putting them into an interesting, relative context. The current exhibition at Modern Arts Midtown hopes to do just this. Entitled John and Catherine, it features recent work by Chicagoan John Himmelfarb and Omahan Catherine Ferguson and runs through December 28. The two are not only represented and shown regularly by MAM, but are also longtime friends. Hence the informality of the show’s title, suggesting that we viewers are welcome to share in a connection beyond happenstance. At first, this may seem a little difficult to suss out. Himmelfarb is known primarily for his paintings, Ferguson for her sculptures and installations. Himmelfarb is a retro-modernist, plying motifs from daily life in the service of reawakening the formal pleasures of painting and the aesthetic rewards of seeing. Ferguson tends toward the conceptual, inviting the transformation of space and material into carriers of spirit and memory. The exhibition itself also features work that initially feel a bit disparate. Himmelfarb’s big, bright and jaunty truck paintings contrast against Ferguson’s small-scale vector drawing-sculptures. 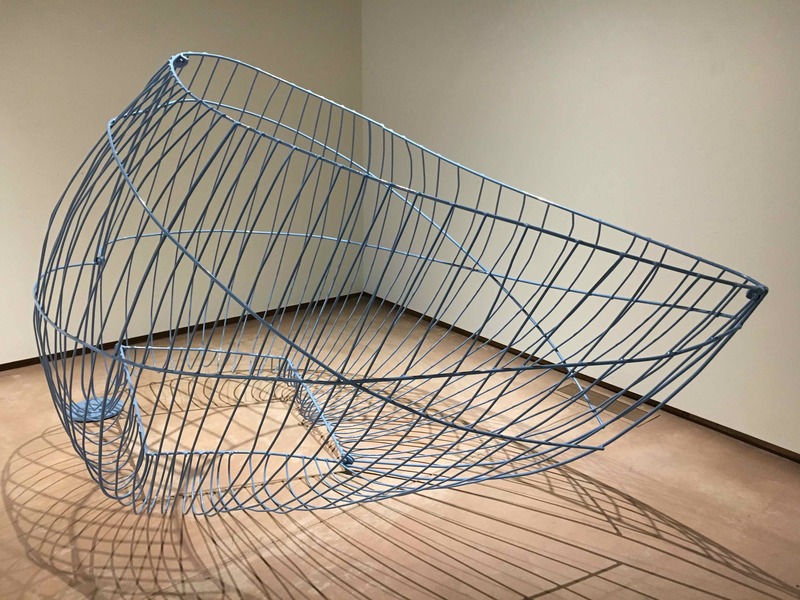 Ferguson’s large-scale wire wall and floor sculptures, with their open volumes and shadow play, are more ethereal than Himmelfarb’s molten and welded truck sculptures under their burdens of cargo. Yet, there is much rewarding commonality to be found in their creative endeavors. Each has shown an inclination toward eliciting degrees of whimsy, investing their forms with distinct personality. Both are essentially draftsmen at heart, displaying a distinct preference for the ways in which line creates shape, movement, volume and descriptive character. And despite Himmelfarb’s label as a painter and Ferguson’s as sculptor, each works across a variety of media. Himmelfarb works in bronze, steel, wood, lithography, etching and drawing. Ferguson’s media stretch across steel, wire, wood, hair, glass, willow, light, sound and found materials. In fact, each new exhibition of Ferguson’s work reveals her in the midst of exploring some new thematic or material pursuit, and this show is no different. Debuting here is her fresh series of portrait heads collectively entitled All My People. Ferguson has turned quick vector sketches of individuals’ heads into laser cut relief sculptures and grouped them into small vignettes on steel shelves. Whether the drawings are caricature or portraiture is ultimately a characterization made by the viewer, as the artist reveals little. Each may have a name—Harold, Lucy and Rhoda. Or be cast as a type—Adriatic Man, Beach Guy, Purple Scarf. Inspired by a paraphrased quotation that “we all have 100 people inside us,” Ferguson has created a cast of characters reflecting the myriad of folks that have passed through both her life and imagination. It’s a world that certainly encompasses family and friends, yet this population of voices may also include those of writers, artists, fictional characters from art, theater, opera, film and literature, among others. There may also be those recalled from random encounters. And then there are those who inhabit our dreams. Ferguson groups her figures together in pairs, trios and even quintets, encouraging our curiosity about their relationships—itself a kind of microcosm of this dual-artist exhibition. Her folks are quirky and charming. “Purple Scarf, Spike, Henrietta, Rhoda and Olga in Pink Hat” could, for example, all be part of a book club or serve on an arts committee with Ferguson. Or they could be totally arbitrary. It is our inclination is to fabricate a story that would connect them all to her, or even to us. They appear colorful and knowable, even with the economy of the artist’s drawing style. Additionally on view are a pair of large scale sculptures created in powder-coated galvanized steel. Adapted from an older installation into discrete and now blue-colored sculptures, each stands on its own. “Del Castillo: Dancing” is in the form of a teardrop shape extended vertically into space, the stacked steel rods narrowing toward the center and expanding toward the top. With the suggestion of its title, the form takes on the animation of a person, bending slightly at the waist, with motion additionally implied by the play of lines on the floor and wall by cast shadows. In Himmelfarb’s work, matrices of anxious line are more robust, sometimes pressed into service of bold expressionism that threaten to obscure the forms they describe. Among his ongoing series of truck images are the Puerto Vallartapaintings. Earlier examples consist of bright, two-color images inspired by an auto-driver’s eye view of the backs of semis and other rigs. The stylized patterns of lines gave the pieces an appealing graphic quality. Newer works from that series are denser and more painterly, as in “Puerto Vallarta No. 89,” with color palette more fiery and foreboding. The change in temperament may be interpreted as an attitude change about the vicissitudes of traffic. But for Himmelfarb it is just as likely to represent another turn in the leveraging of the simple motif into a vehicle for changing formal exploration. A certain weightiness also appears in his large clear-coated steel sculptures. “All the Names” is a flat-bed trailer filled with neatly stacked load that comprise various sizes of cylinders, cubes, rectangular and triangular prisms. What the sculpture achieves with its industrial hue and hefty bulk is consciously offset by the toy-box whimsy of its cargo and the fantasy of irregularly ovoid tires and intentionally casual welds and cutouts. Truly, what awaits the viewer in the main is the humorous side of Himmelfarb, who has recently added some new conceits to the sophisticated-naïve charm of his images and the word play of his titles. Check out “The Gaze Returned,” a large, prismatically colored canvas in which a truck is seen as a model on a pedestal in the studio, waiting to be incorporated by the artist into a landscape painting on an easel. In addition to all the other still life and studio tropes this describes, Himmelfarb has collaged a mirrored surface onto the truck’s windshield—literally returning the viewer’s gaze. Similarly, a vintage rearview mirror has been mounted atop the canvas of “Ferry.” “Come close and you can see yourself in the picture,” it intones, as if calling out our selfie-obsessed culture. 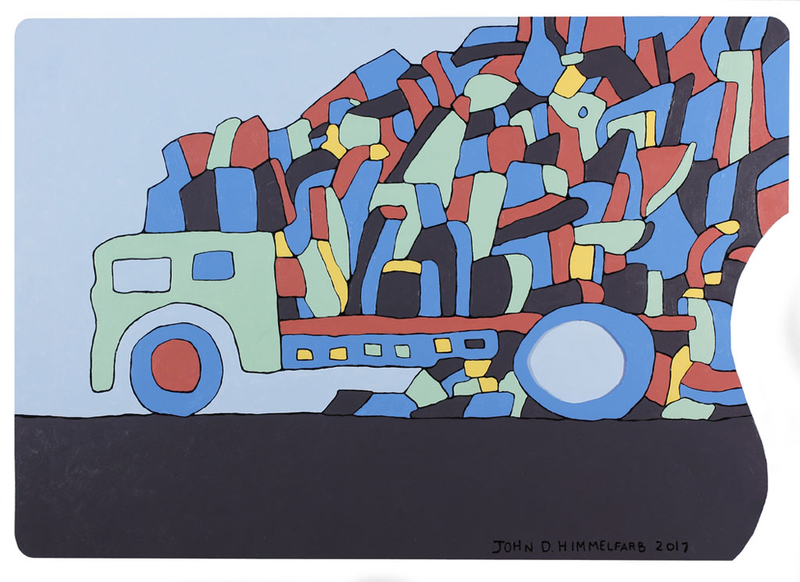 Equally clever and satisfying is Himmelfarb’s word/image play with “Palette Truck.” It depicts a flatbed semi with a precarious and colorful load of cargo spilling off its top and sides. Take another look—the wood on which this is painted is shaped and the back wheel of the semi is hollowed out, all in the form of an artist’s palette. This is Himmelfarb acknowledging literally that the truck is his springboard for artistic transformation, not a study of interstate transportation. Just as some of Himmelfarb’s recent paintings demonstrate a return to a more formal simplicity, his new Iconsculptures are yet more restrained. 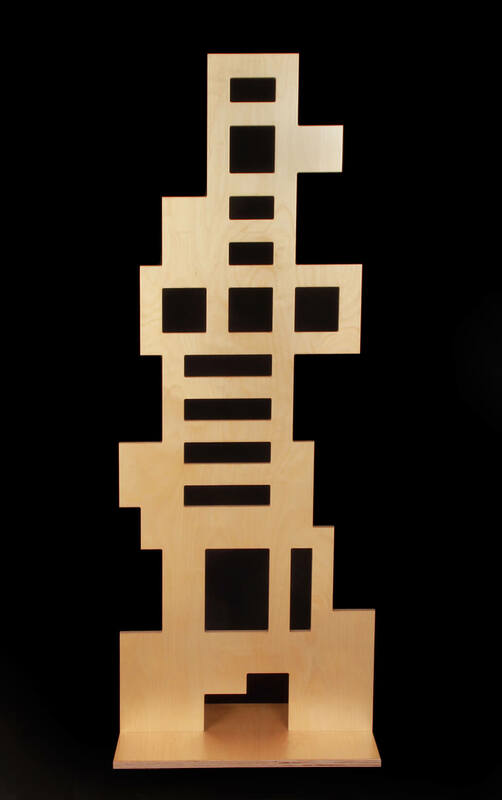 These thin standing sculptures, made of powder coated steel or veneered plywood appear as totems built of graphic blocks or pixels—in a way, archetypes of a modern communication. They are the spiritual heirs to his prior works involving an invented vocabulary of symbols and hieroglyphs, out of which the truck motif originally arose. With titles like “Architect,” “Leader” and “Local Hero,” the sculptures aspire to be portraits, or at least frameworks for describing aspirational citizens. So, what then to make of the pairing that is John and Catherine? It is a study in two artists dealing with issues of scale and line, of description and abstraction. It engages a duo who are rigorous and curious with their media, with the formalities of representation and the presence of the viewer. Who understand what is serious about their art but leave ample room for humor, as well as create the kind of play that engages the senses and the mind. Maybe that’s what friends are for. John and Catherinecontinues until December 28 at Modern Arts Midtown, 3615 Dodge Street. For further information, contact 402/502-8737 or visit www.modernartsmidtown.com.